the invite called for a safari costume. she came as tina turner. nevermind that she channeled tina turner more than the jungle animal she was supposed to be but omigod! she looked so adorable it brought out the stage mother in me i never knew i had. but for all my effort in crocheting that lion beanie because the party called for the guests to come in a safari costume, that thing was only worn for a total of, say, 5 minutes. maybe 8. but definitely not 10. and that’s including the fittings. and how many days did i spend busting my wrists on it? but that’s on and off, though. not like a full-time sweatshop shift or anything like that. and also because i had to do re-do the beanie twice because the first time, it looked like an afro, which is what happens when you’re too cheap to buy proper crochet patterns and the actual free one that you want on youtube is all in freaking spanish! i should post my first two attempts as they were hilarious. also, while my baby is still too young to sue me. but for now, let me share with you some of last saturday’s pictures taken from a college friend’s daughter’s second birthday. it was raven’s first party per se, so now you understand why i kind of went all out with the DIY crochet. but who are we kidding? i LOVE crocheting and i would literally exploit any excuse just to get me to work on new projects. it’s funny how parties are so much different now, now that we have a kid. 90% of the time, jeff and i took turns looking after raven. the other 10% we spent eating and socializing, although i have to admit we didn’t really split that equally between us. with jeff being vegetarian, he was limited with the food choices while yours truly stuffed herself full with good ol’ lechon! let’s just say, of that 10%, i helped myself to 8% of it, leaving jeff with 0.5% to nibble on some fruit kebabs and 1.5% to take pictures of the party which i kind of volunteered him for. but jeff being jeff, he’s a very supportive husband. especially when he knows i could use them as blog material. the only regret he had, aside from being suckered into coming with me on account that “it’s raven’s first party!” in a very whiny voice that could put even the devil himself on a guilt trip, was that he didn’t bring his big flash. and that was because i told him not to. but all in all, it was a nice, intimate party. it was good to catch up with ruby and talk to other mothers as well because i got to exchange notes with them about developmental milestones and what-not. it was quite a relief because i’ll be the first to admit that i’m not very confident as a mother. i mean, i’m not there yet. everything’s still pretty much trial and error at this stage and it doesn’t help that you got all these theories and articles about parenting posted all over the internet about the “proper” way of raising kids that can make any first-time parent go crazy, if not so confused. so jeff and i just take it all in stride and raise raven the best way we both know how: spoil her with all the love and affection that we can give her. so far, i reckon it’s working. because as it turns out, raven seems like a really happy and friendly kid. too friendly, in fact. at the party, she was making all the first moves on the other kids there or giving them kisses or leaning in to give them hugs even when she can barely stand herself. jeff and i couldn’t stop talking and laughing about it on our way home. indeed, she makes life so much better to wake up to. interesting. never heard of that. is that another aussie thing i need to discover? hehehe. So true that the kid might not know what the party is about. If you really want to throw a grand kiddie party, make sure you have a jumping castle 😀 Not my kind of parties too, lol. ahhhhh… so those things actually have a name! hahaha. i’ve seen them around but never really thought they actually have a name. 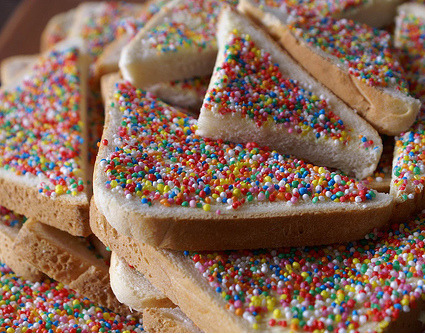 i thought they were “just bread with sprinkles on top.” silly me. should’ve known you aussies have a special moniker for them. like fairy floss, which, my whole life, i’ve always known as good ol’ cotton candy. and let’s not get started on “arvo” and all them aussie slangs. when i get to try it, i’ll tag you! hahaha. o, geng. lingaw kaayo kay ang tango jud ang nag una ug gawas sa iyang upper teeth. my little bumfire. hahahaha. remember that?